A Staten Island man is so annoyed with a lawsuit he thinks is unjustified that he’s demanded trial by combat to settle the issue, if the courts insist that there’s an issue to settle. Name your champions, because it looks like we’ve got a DUDEFIGHT! Luthmann said he seeks trial by combat – a fight to the death by the disputants or their stand-ins – in the event the case against him is not dismissed. “They want to be absurd about what they’re trying to do, then I’ll give them back ridiculousness in kind,” Luthmann told SiLive.com. And yet, he’s done his research (or at least he’s good at giving the impression of having done his research). 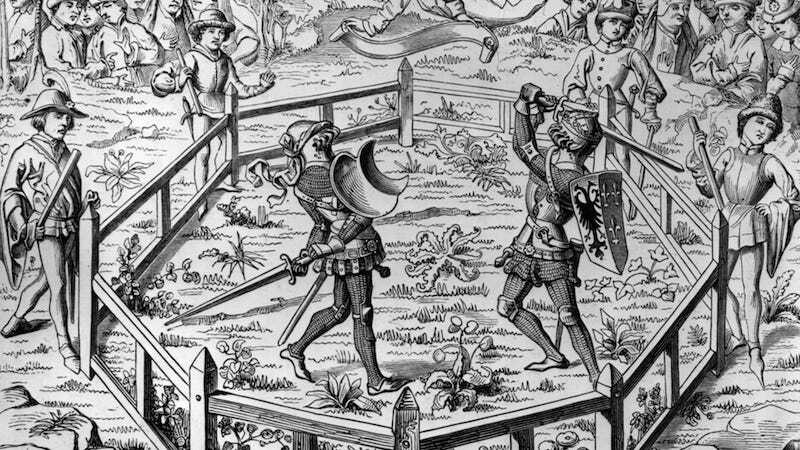 Apparently trial by combat was never technically outlawed? Over the course of 10 pages, Luthmann discusses the history of trial by combat from Middle-Age England to the founding of the Thirteen Colonies.... an attempt to abolish the practice in the Thirteen Colonies was blocked by Parliament in 1774, nor was it subsequently banned by the Constitution in the United States or by the state of New York, Luthmann contends. “I’d love to have a court determine whether we have those rights under the Constitution,” he said. This has been a special legal/Staten Island edition of DUDEFIGHTS, an ongoing Jezebel series about dudes fighting.